My son, despise not the chastening of the LORD; neither be weary of his correction: For whom the LORD loveth he correcteth; even as a father the son in whom he delighteth. Happy is the man that findeth wisdom, and the man that getteth understanding. For the merchandise of it is better than the merchandise of silver, and the gain thereof than fine gold. She is more precious than rubies: and all the things thou canst desire are not to be compared unto her. 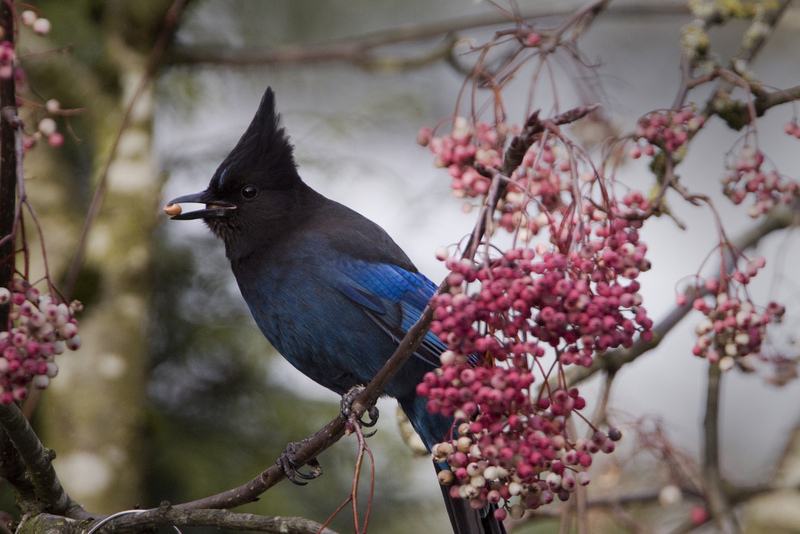 What can we learn from a Steller’s Jay, about how differently people measure what is valuable and what is worthless? One clue to answering that question is found in a strange context, negotiating a contract! But before we examine one of the most famous contracts in human history, to illustrate how differently people value things in this life, let’s review a few facts about the star of today’s show: the Steller’s Jay, a bird that looks more like Batman than any other bird. What’s in a name? (So who was George Wilhelm Steller?) Before analyzing the Steller’s jay as a bird, let’s consider the bird’s name. 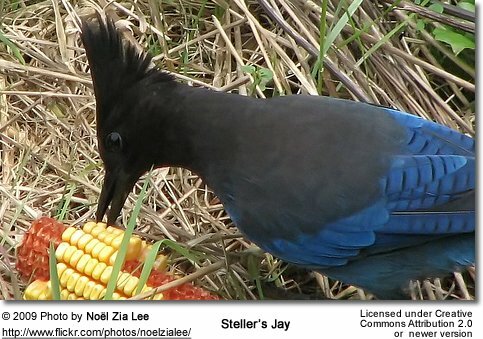 It’s not “stellar jay”, although the Steller’s jay is quite a superstar in his own right! The bird is named for Germany’s Georg Wilhelm Steller (also spelled Stöller and Stohler), a world-traveling scientist, accomplished in botany, zoology (including ornithology! ), medicine (including surgery), and ecology. It was Steller who identified and studied the bird (Cyanocitta stelleri) in AD1741. How did a German scientist discover the Batman-looking bird that habituates many forested areas of North America’s western half? On behalf of the Russian czar, Denmark’s Vitus Jonassen Bering left Saint Petersburg in AD1733, with two outfitted ships (St. Paul and St. Peter) to explore parts of eastern Siberia and its coastal waters. In AD1738 Georg and his wife (Brigitta) left to join them, but Brigitta abandoned the venture in Moscow, while Georg continued eastward, joining Bering’s expedition in AD1740. Adventures on Siberia’s Kamchatka Peninsula included travelling by dogsled, a mode of transport still common in Alaska today. Bering decided to sail between Russia and North America (what is today “Alaska”) and the outcome including adventures, tragedy, and discoveries. When the St. Peter made landfall on one of Alaska’s Aleutian Islands (apparently Kayak Island), amidst dangers and death, Vitus Bering intended only to replenish the ship’s freshwater supplies. 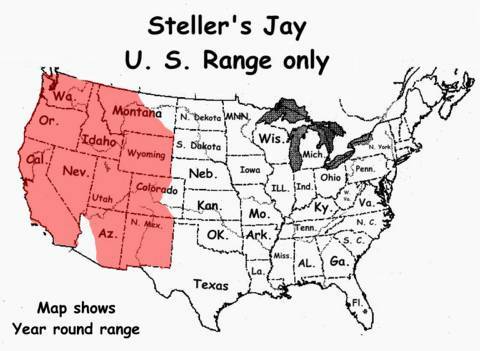 But Georg Steller begged for time to do some scientific research, hoping to prove that the land was connected to North America (not Asia). Bering conceded ten hours only – so whatever scientific research Steller could do, in that short timeframe, must suffice! 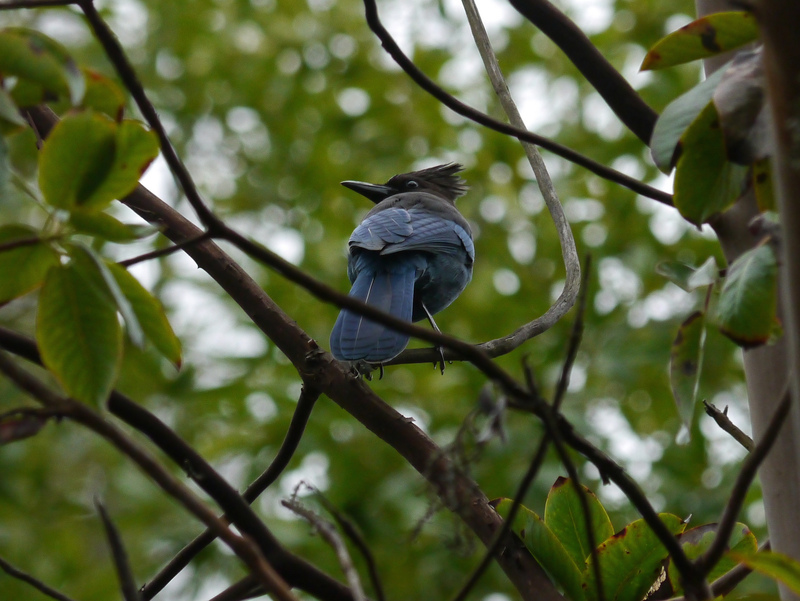 During those ten hours Steller empirically scrutinized (and journalistically documented) a variety of North American plants and animals, – one of them being a crested black-and-blue jaybird, later called “Steller’s Jay” (which was only found in North America, proving that the Aleutian Islands were ecologically connected to North America)! Other creatures bearing Steller’s name include two birds, a smallish sea duck called the Steller’s Eider (Polysticta stelleri) and the Steller’s Sea Eagle (Haliaeetus pelagicus), plus two marine mammals, a pinnipeds, the Steller’s sea lion (Eumetopias jubatus, and a sirenian, the now-extinct (manatee-like) Steller’s sea cow (Hydrodamalis gigas). Most jays (like most corvids) don’t migrate, but some do, especially if food becomes seasonally scarce where they reside. In North America only the Steller’s Jay and its close cousin, the Blue Jay, are known to use mud for building their nests. 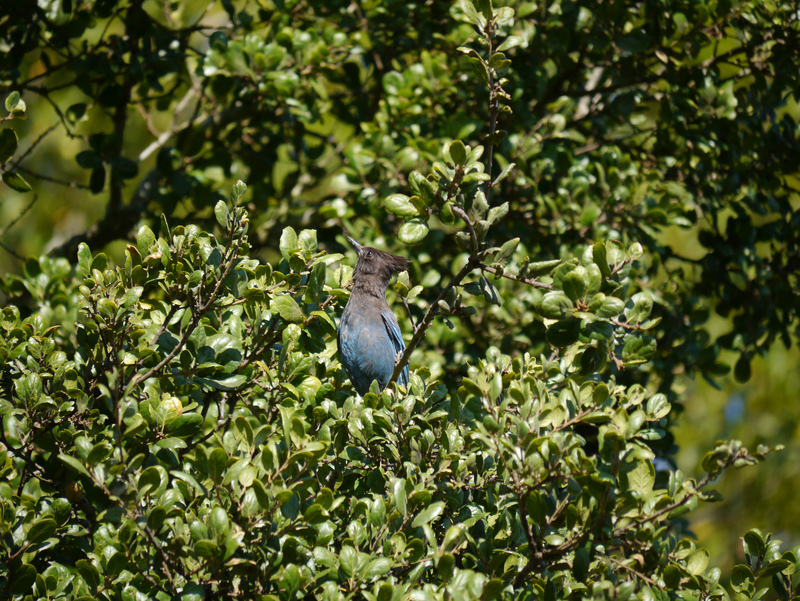 Steller’s jays are most likely to nest, and to be seen in conifer forests, though mixed woodlands with some open spaces characterize some of their ranges. Steller’s Jays are famous for “moving up in the world” – they prefer to reside on “higher ground”, at elevations somewhere between 3000 to 10,000 feet. Typical ranges for the Steller’s Jay are found in southern Alaska, western Canada, Washington, Oregon, Idaho, Montana, Colorado, Utah, Nevada, California, Arizona, New Mexico, and Mexico. [For a different yet similar range map, see Donald & Lillian Stokes, Stokes Field Guide to Birds, Western Region (Little, Brown & Co., 1996), page 324.] Jays, like their crow cousins, are opportunistic food-finders. Steller’s Jays are hunter-gatherers famous for scavenging and “cleaning up” picnic sites – eating feed intended for cattle, dog food, frogs, acorns, sometimes even small birds, plus a cornucopia of human foodstuffs, intended for human consumption as well as some of what is rejected as garbage by humans. Like Blue Jays, the Steller’s Jay is fiercely territorial, killing (and sometimes eating) smaller birds that “trespass” what it deems to be its “property”, so most Dark-Eyed Juncos (and other smaller birds) know to flee when a Steller’s Jay threateningly appears. Like other corvids, Steller’s Jays are known to collect dozens of pinyon pine seeds in their throat-pouch, to hide (i.e., bury) them in protected locations for retrieval during winter months (when their food supplies are less plentiful). Of course, as with other corvids that do the same (see, e.g., the Pinyon Jay), many such buried seeds, if not retrieved in time, germinate and sprout into the next generation of pinyon pine trees! [See James J. Scofield Johnson, “Providential Planting: The Pinyon Jay”, Creation Ex Nihilo 19(3):24-25 (June 1997), posted at https://answersingenesis.org/evidence-for-creation/providential-planting/ and http://creation.com/providential-planting .] It is the jaybird’s garbage-foraging habit that reminds me of today’s Bible text, Proverbs 3:11-15, quoted above. Why? Because many times (for many pleasant hours, actually, especially in the evening hours before sunset), at a huge metal dumpster, near huge conifer trees (close to a dining hall’s kitchen, where table scraps are disposed of after every meal), I have quietly watched and photographed Steller’s jays sifting through human garbage, at Horn Creek Family Camp in Colorado (a complex of Christian family camp facilities in the Sangre de Cristo Mountains). What a joy it was to see those happy jaybirds, darting into the dumpster for food, flitting about, perching, eating, standing watch-guard (as others dove for “buried treasure” – bread morsels, eggs, anything with nuts, seeds, or berries, etc. What humans discarded as worthless, the jays grabbed as food! “One man’s trash is another man’s treasure.” What makes the marketplace move with deal-making? Disagreements about value. Consider the scenario of a tourist eating a lunch at a café. The seller is willing to sell a lunch for $10, and a buyer is willing to buy that lunch for $10. What does their transaction display? Differing opinions about value. The seller values the $10 more than keeping the lunch. The buyer values the lunch more than keeping the $10. So the seller trades the lunch for the $10, and the buyer gladly surrenders $10 to get the lunch. In other words, all voluntary deals illustrate that the buyer preferred the purchase more than the money spent to gain what was purchased. Obviously the seller thought the opposite, or else the seller would have refused to sell at the purchase price. Every day we are making value judgments — deciding the values of things, and we make value judgments differently. This is illustrated in Genesis 25:29-34, when Esau exchanged his birthright for a bowl of red lentil soup. Esau’s twin brother, Jacob, was so pleased with the deal that he added complimentary bread to go with the red soup! Think of how those two men disagreed about the value of the birthright – the Bible says that this transaction showed how Esau “despised his birthright” (Genesis 25:34): it was worth less than a bowl of soup to him! Yet that specific birthright had a unique (and eternal) feature to it, it carried the Messianic lineage, the human ancestry of Christ. Priceless! Yet Esau traded it for a transitory value, a bowl of red soup. Surely we would not foolishly sacrifice something so valuable, something with eternal spiritual value, for something so ephemeral and worldly, as soup, right? Yet the Book of Proverbs challenges us, axiologically speaking, on that same value-choice: how much do we really value God’s wisdom, godly understanding? What if getting that kind of wisdom involves some experiences of discomfort, or pain, or afflictions, or a series of parental “spankings” from our caring Heavenly Father? Many earthbound humans strive to gain the treasures of this temporal life: the merchandise of silver, gold, rubies, — or maybe high-tech equivalents of those treasures. But true wisdom and godly understanding are better than those, “and all the things thou canst desire are not to be compared” unto God’s wisdom (Proverbs 3:15) and what it gains, in time and especially in eternity. Some have traded spiritual opportunities for the values of this wayward world. Others have done the opposite, trading the worldly opportunities of this wayward world for Christ-honoring “investments”, laid up in Heaven. That’s why, whenever I remember those Steller’s jays foraging at the family camp dumpster, by those Colorado conifers, I’m reminded: “one man’s trash is another man’s treasure.” As the serious-about-living-life missionary Charles T. Studd once put it: Only one life, ’twill soon be past; only what’s done for Christ will last. Jim Johnson (who formerly taught ornithology and avian conservation at Dallas Christian College) has been fascinated with Steller’s jays from the first time he saw one in Colorado, even though it gained him a reputation for “always hanging out by the [camp] dumpster” to watch them. By God’s grace, Jim tries to live his fast-paced life according to the values of Proverbs 3:13-15. 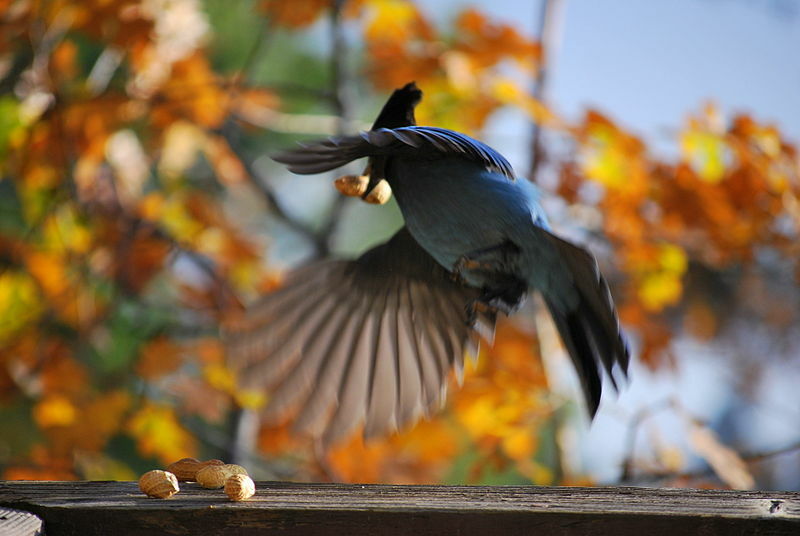 This entry was posted in Birds, Birdwatching, Christian, Orni-theology and tagged choosing, Esau, Genesis 25:29-34, Georg Steller, Jacob, Proverbs 3:11-15, Steller'sJay, trash, treasure, value judgments. Bookmark the permalink. Thank you—insightful connection. What’s really important in this life is the eternal. But we get to enjoy these wonderful creatures while we are here.